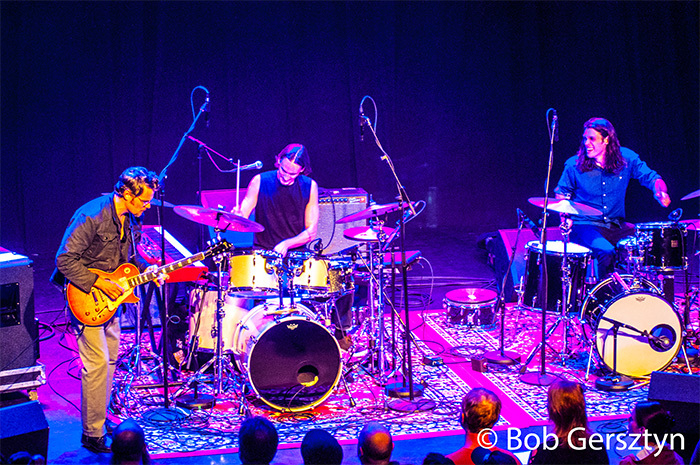 The North Mississippi Allstars (NMAS) comprised of brothers Luther and Cody Dickinson first formed in 1996. They were precursors of duos like the Black Keys or the White Stripes, only using guitar and drums in its most basic form. Most of the time they pick up a bass player ranging from Duwayne Burnside, son of R. L. Burnside to Phil Lesh, from The Dead; tonight it was Rob Walbourne, who also played drums beside Cody the main drummer. NMAS is a “Jam Band” much like the Grateful Dead was, improvising and rearranging as they play “Roots Music,” Their father, the late Jim Dickenson was a contemporary of the “Grateful Dead,” as well as being a session musician, a solo artist fronting his own band, “Mud Boy and the Nuetrons.” The elder Dickinson was also a record producer for the “Rolling Stones,”Bob Dylan and Aretha Franklin, founding “Zebra Ranch” in Hernando, Mississippi. Growing up the brothers lived down the street from an old time Juke Joint and up the Road from R. L. Burnside’s residence, where they went for guitar lessons. Their youth was steeped in the blues and rock as they developed through the nurturing of their multi talented father and all the influences surrounding them. Their 2000 release, Shake Hands With Shorty was nominated for a Grammy as “Best Contemporary Blues Album.””NMAS” have been John Hiatt’s backup band and Luther was lead guitarist for the Black Crowes from 2007 – 2011. Their current tour is promoting their 2017 release Prayer For Peace. The show began at 9:00 P.M. on Saturday, October 14, 2017 at Revolution Hall in Portland, Oregon with Leeroy Stagger, a Canadian who grew up in rural British Columbia and plays what could best be described as country folk rock, reminiscent of seminal bands like “Mason Proffit” or the “Flying Buritto Brothers.” Today bands like the Decemberists and Mumford and Sons mine the same vein. He apologized that they were normally more of a rock & roll band, but that they lost their drummer for a few months and were performing as a string trio. They performed original material inspired by artists ranging from Joey Ramone, Joe Strummer and Bruce Cockburn and were both entertaining and inspiring. Before their set was over Steve Berlin of Los Lobos joined the band on baritone saxophone and together they played “Run Rabbit Run” and rocked the house. 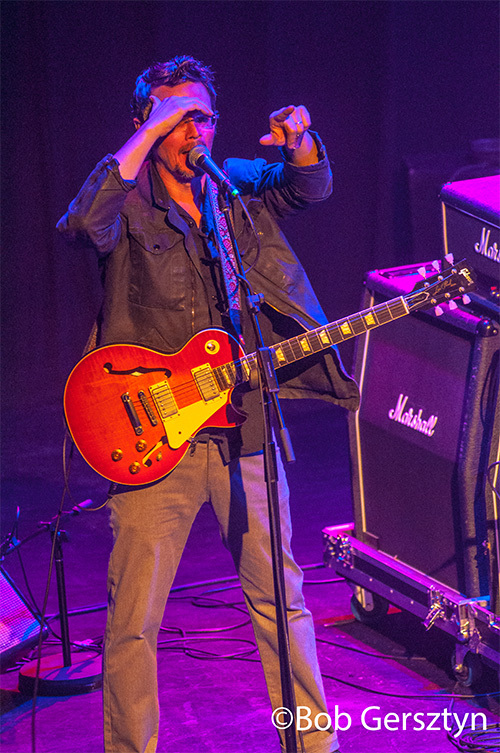 Around 10:10 P.M. the “North Mississippi Allstars took the stage with Luther Dickenson walking over to his Marshall stack while Cody sat behind his drum kit along with Rob Walbourne behind an adjacent one. The show began with a total aural assault as the band dove into some of the best acid rock that this writer has heard since Jerry Garcia was still alive. The music went from loud and complex to loud and driving, using compositions for vehicles that mediate the inner avenues of the consciousness. The only thing that was absent was the presence of “Owsley Orange,”as the band played “Going Down South,” with an insane vengeance. “Long Haired Doney” was one of the cuts from the new album that rocked with a mesmerizing beat as Luther used guitar feedback and fret runs to compliment Cody’s systematic drum beat. Rob Walbourne moved from drums to bass back to drums continually throughout the show, which in some cases freed up Cody to pick up a guitar and jam with Luther. “Deep Elem Blues”was another cut off the new CD, which was performed by the “Grateful Dead”and is a traditional tune that dates back to the turn of the 20th century. Cody sang lead with his gravelly voice, as Luther picked out the blues on his guitar with dexterous delicacy. To say that Luther Dickenson is an amazing guitarist is an understatement. The band moved through their set by intensely jamming from one tune to the next with driving drums, screaming guitars and throaty singing. The band seamlessly segued from “Po Black Maddie” to Hendrix’s “Hear My Train a Comin’,” without missing a beat. The drum driven rhythm was augmented by the incendiary guitar runs that Luther shredded on his Gibson ES as he moved from the left side of the stage to center stage where he jammed with Cody and Walbourne until they nearly tore a hole in the fabric of reality by their intensity. Steve Berlin of “Los Lobos” joined the band to lend a hand in the jam as he alternated his baritone sax runs with Luther’s insane guitar runs and at the same time mimicked Luther’s voice with the sax, as drums and bass joined in to form a hypnotic beat. “You Got To Move” was another cut off the new album that Luther and Cody sang together as Luther squeezed every note possible out of his Gibson Sunburst, with Steve Berlin providing fills with his sax..
Then Cody began to tell the audience, “you got to care for one another,” as he dove into another, Hendrixian wailing guitar solo as he stood there straddling the microphone stand. Then he turned to the amps and began to wail feedback drenched licks, with Berlin wailing counter riffs on his sax. Cody pulled a guitar strap over his shoulder and had a guitar duel with Luther, as Walbourne took over on drums, with Berlin wailing on sax. This time Cody announced, “ my mama told me to learn three chords on the guitar and play them open,” as he introduced the next song as a Bo Diddley composition. “Who Do You Love” is one of those seminal songs that every rock aficionado knows. Cody and Walbourne shared duel drum kits once again with a driving beat along with Steve Berlin’s huffing sax. When Luther came in with his guitar it turned into a long jam with Berlin and Dickenson alternating on lead as they moved to the left and right sides of the stage sandwiching the drummers as the jam exploded into the stratosphere with the audience on their feet and dancing with abandon. When the set ended the audience screamed and stomped until the band came out and gave the crowd what it wanted.